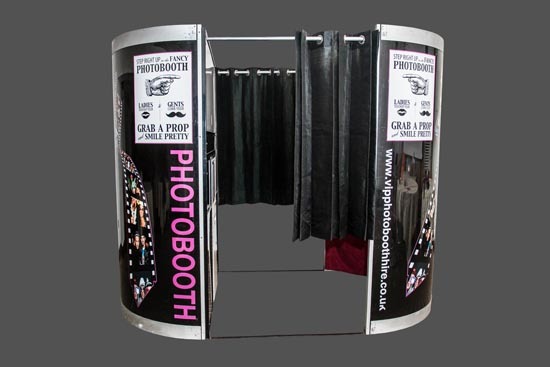 Our Super Booth is a solid, high gloss black booth with bright chrome trims, big enough to fit 10 – 12 people, and meets the DDA regulations for wheelchair access. It comes fitted with colour changing internal light boxes, a 20″ Touch Screen, a Canon SLR camera and an HD wide angle web cam to allow for unlimited video recording. It also has a green screen and uses the latest software allowing all photo booth users to upload their pictures to Facebook the moment they are taken. You have the choice of a single picture or a multiple of 4 pictures (passport style) printed instantly in colour or black and white using top of the range photographic printers. We use a Canon 650 SLR with 18 million pixels which means that you get a crisp, full colour picture. Get up close for portrait images. All pictures are high resolution so they can be blown up to poster size without losing quality. 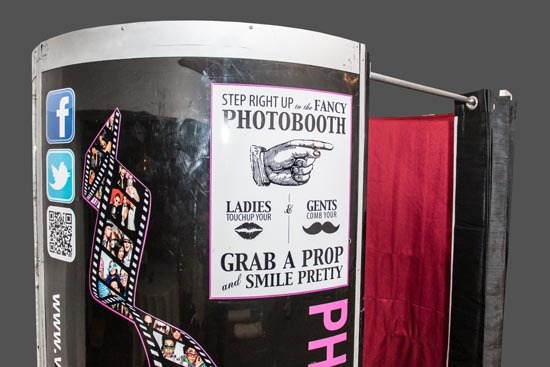 Our simple to use on screen instructions mean that just about anyone can jump in to one of our photo booths and start taking fun filled pictures. With just one touch on the screen, you can watch yourself on the full colour screen. Then, with one more touch, have your print ready within just 15 seconds. The HD web camera is the ideal choice for making that special video from a quick congratulations at you best friends wedding to a full 5 minute sing along. One touch on the screen allows you to make endless videos. Then, once finished, one more touch and you can replay the video on the screen while it’s saved to the hard drive for viewing and sharing later. Our super booth was designed to meet the current DDA regulations for wheelchair users. It has the required turning circle to allow wheelchair users to enter and exit the booth independently and the camera is fully adjustable to accommodate different heights. We have a really extensive prop box full of bright, colourful props. You’ll find anything from bright pink wigs, massive star sun glasses, blow guitars and saxophones, full faces masks and feather boas! One thing that’s guaranteed is that you’re sure to get a fun filled shot! We provide you with a top quality guest book for your guests to include their best shots and write you a message. There are a large choice of colours and styles, leather or suede the choice is yours. We even have a range of guest books that can be personalised to suit any type of event. When you enter our photo booth you get offered a choice of picture layouts. You can have a single 6″ x 4″ with your personal message along the bottom, or the same 6″ x 4″ layout but split in to 4 so you can do 4 different poses. Your message is displayed along the centre of the photo. 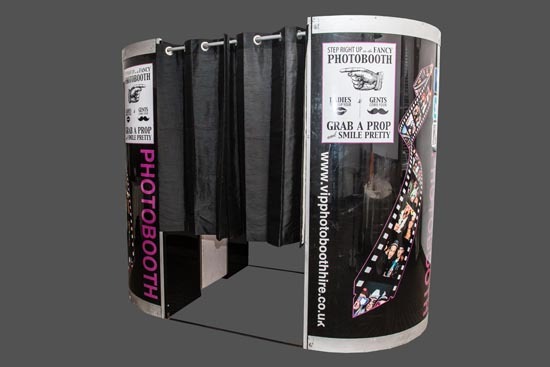 All your photos can have your company logo printed on them, making our photo booth ideal for companies aiming to promote brand awareness. Jump in, take that perfect picture, watch as the screen gives you the option to print and upload the picture to Facebook. Once uploaded, it will appear on our facebook page instantly where all your guest with a smartphone or ipad will have instant access to the pictures. This allows you to add a different background behind you and your guests. Transport yourself to a sunny beach or outer space, all at the touch of a button; we have selection of background images or use one of your own. Get that wind swept look with our industrial size fan. Hang on to your hats as they will come off!!! Our booths are all video enabled which means that all your guest can leave endless video messages completely free of charge. Upload and share your pictures from our online albums. 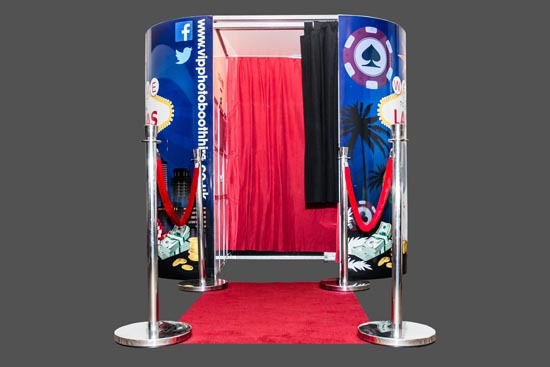 Give your guests the full VIP treatment with our chrome poles and velvet ropes at the entrance to the photo booth. 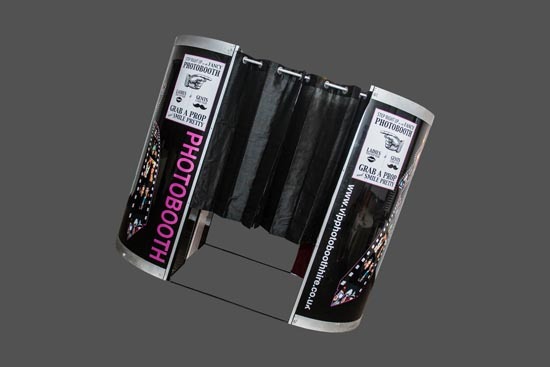 Give the outside of you photo booth that extra sparkle with our multi colour LED uplighters. I just wanted to say thank you to you, and James, for the photo booth on Saturday night. We all had a great time and the booth was amazing: everybody loved it! I need to apologise to James as I realised after the party that I hadn’t told him to help himself to drinks and food. I am so sorry. I will certainly recommend you guys to friends. These are our most popular booths either the oval or the more tradition square booth are jam packed with up to date features. 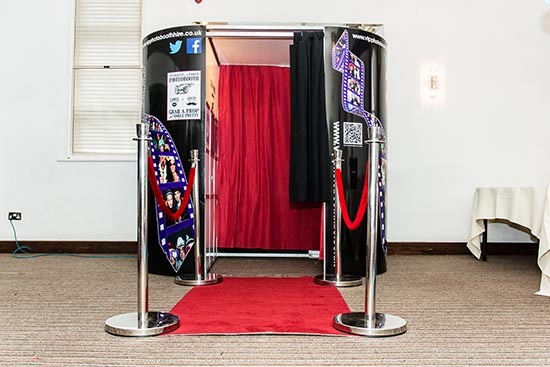 Our classy looking Chic photo booth has all the same up-to-date features as our popular party booths. 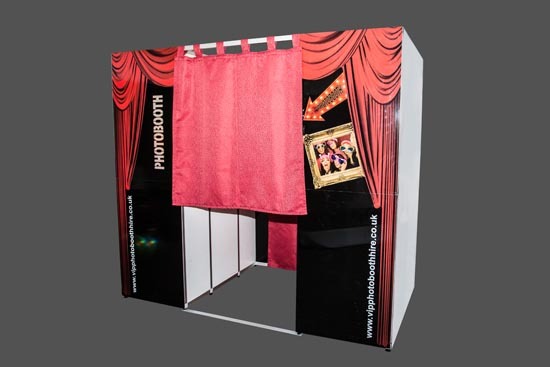 Our Vegas themed photo booth is a bright, colourful, eye catching add on to your Vegas Themed event. 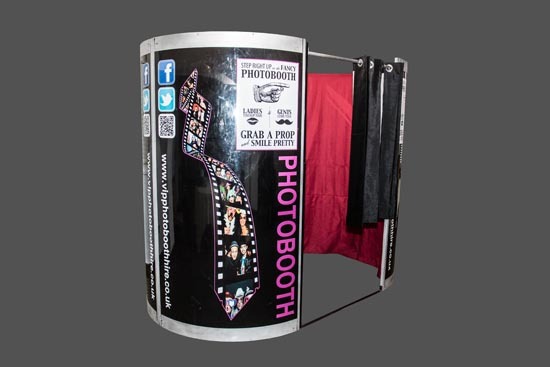 We offer photo booth rental for parties, weddings and special events (including corporate). We cover Essex, Kent, Surrey, London, Suffolk, Bedfordshire, Cambridge, Sussex, Hertfordshire, Oxfordshire, Peterborough, Buckinghamshire, Wiltshire, Gloucestershire, Hampshire and Norfolk.